Trying to deal with rejection at the best of times – is hard. When job hunting; it is so very easy to get disheartened especially when you’ve been sending out application after application only to receive rejection letters back. But, don’t lose hope; while it is hard to take, rejection is a normal part of the whole job hunting process which can only help you grow stronger. 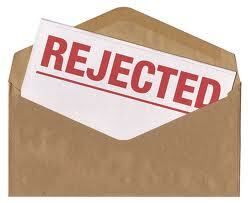 Every rejection letter is taking you one step closer to a job offer. Until you get there and land that job – here are some tips to help keep your spirits up while you look for work. Even though it probably feels very personal to you, not getting that job interview is NOT a rejection of you as a person. What it does mean is that in the opinion of the interviewer you just weren’t the right person for the job, or there was another who seemed more suitable. At the end of the day sadly only ONE person can get the job, but, it’s okay – there is another position out there you are perfect for. Always remember that you have excellent qualities and skills that will be perfectly suited to another position at another company – it’s all about finding the *right fit*. You need to focus on the strengths and achievements you do have, write out a list so you’ll be able to describe then with enthusiasm and confidence at your next interview. Every time you get a piece of positive feedback – add it to your list! If you are struggling to find anything to add to the list, ask your friends and family what they see as your strengths. At times we tend to see only the negatives and we don’t see what others see in us – you’ll be surprised! #3 – If you need to improve, find out how. While it is important you don’t take rejection personally you may need to look over how you approach people. Can you improve on your cover letter? Your resume? Or your phone manner when you call? Is there something you can improve on? In your resume does it address all of the selection criteria? Have you highlighted the ways you can benefit the company? Have you proofread everything to make sure you got people’s names right and that the name of the interviewer has been spelt correctly? Remember it is competitive out there – in some fields more than others – so getting an interview is no mean feat and is something to feel good about. Keep in mind that being a good interviewee takes practice! If you have been looking for work for a while, it is a good idea to take a small break and re-energise yourself. Taking yourself away from your mobile, the Internet or your computer could be just what you need. Just going to the beach or for a walk in the afternoon can help clear your mind so you can return to your job search renewed and ready to continue. Finding a job takes persistence, learn from your experiences and improve on your interviewing skills and resume writing skills. Remind yourself that rejection is just a part of the process that everyone has gone through at some stage. Never give up because your dream job might be just around the corner! How do you handle rejection? Does it get your down? Or does it spur you on? Feel free to share your thoughts with us.